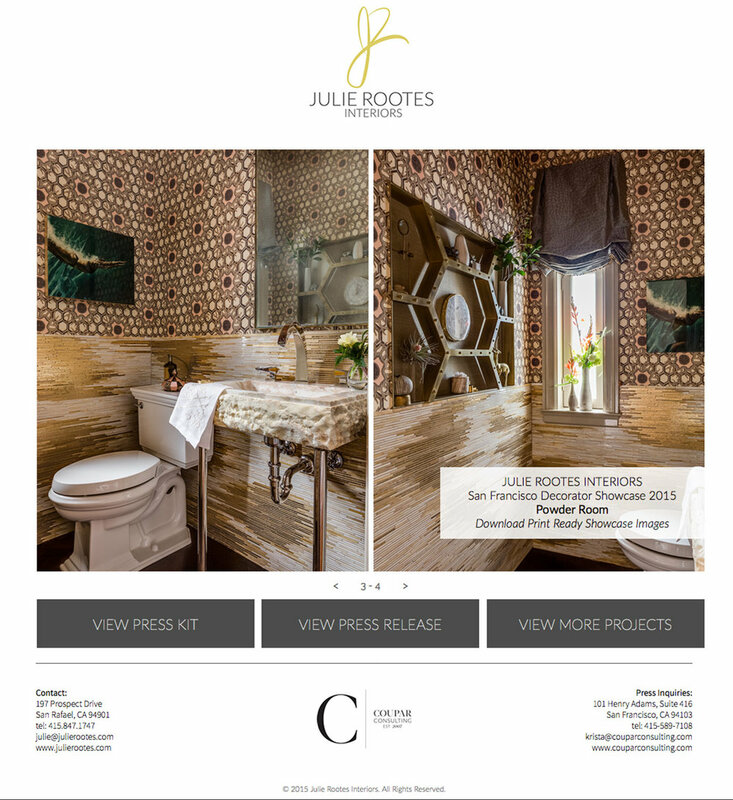 Julie Rootes of Julie Rootes Interiors came to us as an emerging designer eager to develop her portfolio and increase her brand recognition through the San Francisco Decorator Showcase. We worked with Julie to finalize the details of her design and assemble a presentation board to present to the Showcase committee. Our efforts resulted in Julie’s selection for the 2015 San Francisco Decorator Showcase. Our team created a custom virtual media kit for Julie's room leading the press straight to the information they needed when crafting the space’s story. With the help of our Showcase package, Julie’s elegant powder room was featured in a variety of publications and news outlets. By increasing Julie’s brand visibility, expanding her portfolio, and crafting her story, we were not only able to expand the designer’s network of vendors and clients but also enable her participation in the 2015 Traditional Home Napa Showcase, which resulted in her inclusion in the October 2016 issue of Traditional Home.